Presonus HD9 Professional Closed-Back Studio Reference Monitoring Headphones. Precision-Tuned, Closed Back, Circumaural Acoustic Design. Tailored Frequency Response: 10Hz - 26 kHz; 3 dB. Accurate Low-Frequency Response. High-Power Handling: 1,800 mW @ 40 Ohms, 900 mW Per Channel. 45mm Dynamic, Neodymium Drivers. Two-Axis, 180° Cup Rotation. Lightweight. Comfortable, Long-Lasting Ear Pads. Adjustable Headband. 10 foot (3m), Straight, Single-Sided Cable with 1/8" Connector. Includes: Gold-plated 1/8 inch-to-¼ inch adapter, Storage Bag. 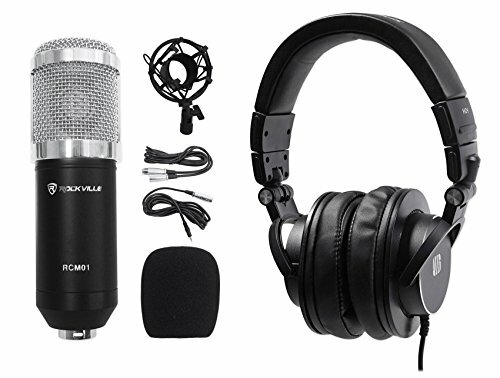 Rockville RCM01 Pro Studio Recording Condenser Microphone Mic+Metal Shock Mount. RCM01 condenser microphone . Full metal high quality construction. Polar Pattern: Internally Polarized Condenser Cardioid Design. Large diaphragm for smooth, natural sound and low noise. Power Requirements: 48V DC phantom power or computer sound card (can connect to the phantom power channel of your mixer or can connect to your laptop or computer). Uni-directional. Sensitivity: -27dB2dB(0dB=1V/Pa at1kHZ). Output impedance: 200Ω30%(at 1kHz). Standard operating voltage: 3V. Operating voltage range: 1.5V-10V. Current consumption: less than 500uA. Voltage deduction characteristic: within 3dB at 2V. S/N ratio: More than 24dB. Frequency Response: 30Hz - 20 KHz. Fixed Crossover Filter cutoff frequency: 40Hz---16 KHz. Load impedance: Greater or = to 1000 Ohms.